After the government was forced to do a u-turn on selling off Britain’s woodlands in February 2011, they set up a forests panel to help decide what to do next. [full details here: http://www.defra.gov.uk/rural/forestry/panel/ ]. Then on May 19th 2011, they launched a de-facto consultation, requesting peoples’ views on what forests and woods deliver for people, communities, nature and the economy, drawing up a list of questions for people to respond to. 1). What do forests and woods mean to you? 2). What is your vision for the future of England’s forests and woods? 3). What do you feel to be the benefits of forests and woods? This could be to you personally, to society as a whole, to the natural environment, to the economy? 4). We would like to hear about your suggestions of practical solutions and good practice which can be replicated more widely. 5). What do you see as the priorities and challenges for policy about England’s forests and woods? The consultation ended on 31st July 2011. TLIO’s response at the time is copied below. The government’s fast-track cuts agenda has been preempting the excuse for sell-off whilst cuts in the Forestry Commission budget are deemed necessary in response to a 25% reduction in the Department for Environment, Food and Rural Affairs’ (DEFRA’s) funding imposed by the government as part of government cuts. 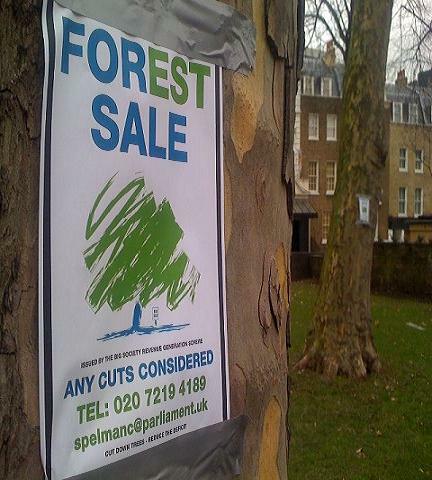 Despite having ditched clause 17 & 18 of the Public Bodies Bill after huge public outcry across the country in early 2011 (half a million people signed 38 Degrees’ petition), the fact remains that within the existing legal framework, the government can sell-off up to 15% of it’s public forests in each four-year public spending period (15% sell-off every 4 years means some 38,700 hectares, could be sold off over the next five years). However, in ditching the initial plan for wholesale sell-off, the existing 15% sell-off and future sales are now subject to them agreeing new acceptable criteria for sale which they consulted upon in a review into the future of the public forest estate, which was conducted by an independent government-appointed panel. The panel also explored the issues of public access and biodiversity within the review. The Forest Campaigns’ Network comprised of all the regional grassroots campaigns across the country were not given a seat on the Forestry Panel. On the panel were representatives of the big NGOs (such as the National Trust, RSPB & the Woodland Trust – all of whom were criticised for being initially slow to respond critically to the government’s unconditional sell-off proposals). Initially there were concerns that the panel, in answering to the same minister who cooked up the plans to sell the forests in the first place, could be under pressure to rubber-stamp more sell-offs. This has thankfully proved not to be the case. With the spread of Ash-die back and sudden-oak death a continuing reality, the situation puts the onus on us as landrights campaigners to maintain and build upon the networks that have been forged in resisting the government’s initial plans, rallying behind a public defence of the country’s public forest management body (the Forestry Commission) so that it is better equipped to defend our broadleaved heritage from a rapidly spreading disease. As such, this is why it is important to be absolutely clear on why we value our forests remaining and thriving in public ownership. Meanwhile, the Forest Campaigns’ Network will continue to exist as required in reaction to any future emergency developments. First and foremost, all jobs, funding, and infrastructure of the Forestry Commission should be preserved at least at the level that they were at the time of the election of the present government. Substantial cuts in the FC budget and operational activity which are taking place right now will mean the ability of the Forestry Commission to do its job properly will be compromised. It is setting the FC up to fail in meeting it’s operational remit before the final recommendations of the Forest Panel are published. There should be no job losses, no closures or amalgamations of regions and regional and local offices. England’s forests are effectively and efficiently managed within the public sector, and this situation should continue. The Forestry Commission (FC) controls just 18% of woodland in England, yet the Commission produces 60% of home grown timber, and harvests 92% of its softwood increment, as opposed to just 37% in the private sector. The public forest estate counters the business cycle by a steady timber harvest irrespective of market conditions through their network of staff and contractors, their forest infrastructure and year-on-year thinning and planting operations. By contrast, only 60% of all private woodlands are in management schemes. The 15% sales programme announced by the minister for the 4-year period of the public spending review should be stopped. Sell-off/ownership transfer to community trusteeship is misconceived because fragmentation of publicly-owned forestry undermines the underlying principle of cross-subsidisation within the Forestry Commission (FC) management structure, with profitable forest subsidising loss-making forestry in order to attain environmental management objectives. The rational of forest sell-off is also flawed in terms of the market supply of timber because privatisation takes away the market stability the nationalised resource is afforded through steady planned harvesting programmes through year-on-year thinning and planting operations which provide a counter-cyclical market-stabilising influence over fluctuating market prices for timber, which in turn provides a stable economic environment for a whole infrastructure of sawmills, processors and forestry contractors. This is the reason why, in our opinion, all English Forests currently owned by the FC need to remain in the ownership of the FC. State ownership provides a degree of insulation from the irrationality of the market, a degree of potential public accountability, a multi-functionality, and an access to professional and funding resources which is beyond anything which even the largest third sector or private organisations can achieve. And the FC doesn’t just grow trees. They are a major player in the restoration of ancient woodland, as well as endangered heath, mire, fell, and other open habitats. About 26% of Forestry Commission land has SSSI status and 96% of this is in favourable condition. The FC coordinates forestry management across all its forestry, which contrasts with only 60% of private woodland/forestry. More pertinently, with existing woodland which has been sold into private hands, for example in Sussex, there has been an increase in the incidence of a loss of coordinated management with coppice thrown out of cycle and left unmanaged, and an increase in other negative repercussions such as reduced maintenance such as with gates, structures, warnings against trespass, lights, clearances, and in extreme examples, dumped vehicles, flytipping and numerous fire sites. With dark forboding, the cuts to the Forestry Commission and the resulting shrinking of the FC’s capacity comes at a time when there is a frightening spread of Sudden-Oak death across our natural and semi-natural woodland. The suspicion that this raison-detre of public sell-off will continue irrespective of a proper evaluation of the singlemost importance of the Forestry Commission in how it manages our woodland as the FC’s operational capacity is being shrunk betrays the fact that in the face of a rapidly spreading disease, on the contrary, a more considered mandate would be to increase investment in arboricultural work across England and the UK to stem the tide of this disease and increase the FC’s operational capacity to employ more thorough all-encompassing regulatory mechanisms in the management of all woodland across the UK. As such, we firmly believe that the Forestry Commission with national coverage which applies a consistent informed approach in its work in all areas of the country where it exists is an arrangement which is best equipped to defend our broadleaved heritage from a rapidly spreading disease. As such, this is indicative of why it is important that our forests should remain and thrive in Public ownership. The FC should seek to expand public involvement in its decision-making processes. The abolition of the Regional Advisory Committees should be reversed as a first step. Whilst we accept the quality of the Forestry Commission’s public consultation we believe that the democratic involvement of the public could be greatly deepened and extended. This will require new resourcing, which we fully support. Additionally, we believe that a new focus on providing additional public access benefits in the Commission’s leasehold woods (which didn’t benefit from dedication as CROW access land) should be initiated. Finally, all woodland within England should become statutory open access land under the terms of the CROW Act (2000). For many areas of England the only remaining substantive areas of semi-natural habitat are woodland. Many areas of England, particularly in the midlands and eastern England, saw very little benefit from the CROW Act ‘right to roam’ clauses.